We are renowned stockiest of original Denison pumps & all spares. Our range of Denison Hydraulics Vane pumps & Cartridge kits include Single, Double & Triple Vane pumps. 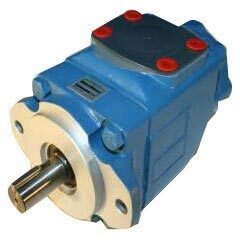 Denison hydraulic pumps are available in various models that include T6C, T6D, T6E, T6CC, T6DC, T6EC, T6ED, T7 series and T6DCC. In addition to it we also provide cartridge kits, shafts, seal kits and the complete pump unit is available in ex stock. We are stockiest of cartridge kits for servicing Vickers Denison Pumps.We offer imported Vickers equivalent cartridge Kits & original denison cartridges kits for Mobile & Industrial applications. The vane design with self compensation for wear and clearances make volumetric efficiency of pump nearly constant over service life. The intervene design of the vane pump keeps the vanes in constant contact with the cam ring. Even at higher speeds & pressures this self compensating vane tip wear feature provides high performance over life of the pump. Cartridge kits are the primary way to service the pumps to restore the pump performance, lower the replacement cost and reduce downtime. Cartridge Kits of Vickers 20V/VQ(5,8,11,12,14 GPM),25V/VQ (12,14,17,21 GPM),35V/VQ (25,30,35,38 GPM) & 45V/VQ(42,50,60 GPM) series are used to service single & double Vickers vane pumps of series 2520V,3525V,4525V,3520V,4520V etc.The cartridge kit is independent of the shaft allowing for easy change of flow capacity and field servicing without removing the pumps from its mounting.